On August 27, 1776, the men of Colonel Jedediah Huntington’s 17th Continental Regiment marched into a wooded and remote part of a Revolutionary War battlefield on Long Island and into oblivion. No regimental or other history was ever written to tell us what happened to them, no heroic tales of victory around the fireside, and no monuments erected to commemorate their sacrifice. To history, they were simply cut off and destroyed. Fortunately, a few survivors of that awful day left little pieces of information in their pension applications, letters and diaries that, pieced together more than 230 years later, finally lift the veil and tell the story of their service and sacrifice. 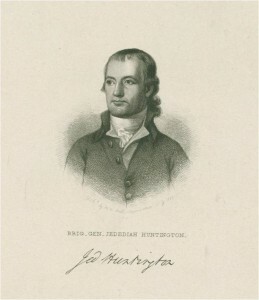 Colonel Huntington, later a brigadier general, was a prominent member of a founding family of Norwich, Conn. In April, 1775, only days after the Battles of Lexington and Concord, Huntington set off at the head of his local Norwich militia regiment to join other colonial forces quickly gathering around Boston to oppose the British. When the standoff at Boston became an extended siege, his regiment was reorganized as the 8th Connecticut Regiment and adopted as part of General Washington’s first Continental Army. The regiment then remained part of the American encampment at Roxbury during the Siege of Boston, until the end of 1775. Not anticipating a lengthy war, the term of enlistment of the men in Washington’s first army expired at the end of the year. But the British were showing no signs of leaving Boston as that deadline approached, and the Continental Congress authorized the organization of a second Continental Army. The new army was raised for one year, from Jan. 1 until Dec. 31, 1776. At the end of 1775, the 8th Regiment disbanded, and Huntington became colonel of the new 17th Continental Regiment, a Connecticut regiment. Many men in the new regiment were reenlistments from the old 8th Connecticut or other regiments from the first army that had disbanded. They were from all over eastern and central Connecticut with a smattering of soldiers from western Connecticut, Massachusetts and Rhode Island. There is a popular misconception that all of Washington’s army was an inexperienced and undisciplined rabble. For many regiments, that may have been true, but not for Huntington’s. Many of the older men and officers had seen considerable action in the French and Indian Wars, and Colonel Huntington was a spit-and-polish commander who made sure his men were well-trained, uniformed and equipped. 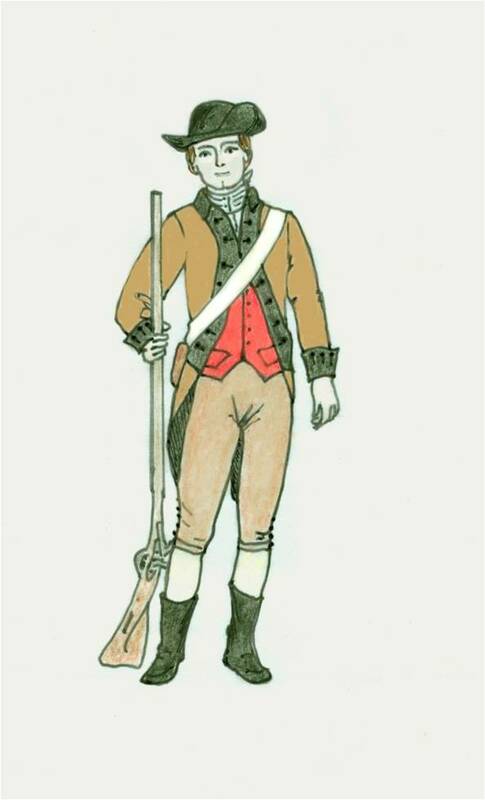 General Washington made an effort to provide a common uniform for his new army that consisted of a buff, or light brown regimental coat, a waistcoat and brown cloth or leather pants. The distinction between the regiments was to be made in the color of the waistcoat and the facings. The facings were the trim of the uniform: the lining, lapels, cuffs and collars. The 17th Regiment, which adopted black as its facings, became known as the Black Facings. They probably also wore a scarlet waistcoat and a round-crowned, wide-brim felt hat, sometimes turned up on one side of the head. The 17th Regiment played a significant role in forcing the evacuation of the British from Boston, when it helped fortify Dorchester Heights in March 1776 with guns General Henry Knox had dragged across Massachusetts from Fort Ticonderoga. Under the threat of bombardment from those heavy guns, the British pulled out of Boston, and Washington marched most of his men, including Huntington’s Regiment, to New York, expecting that the British would invade there next. 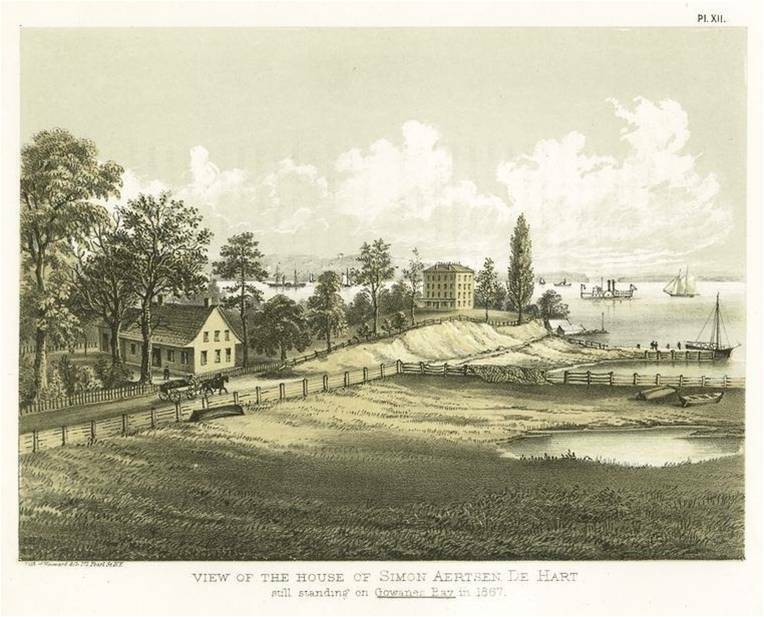 Once in New York, the whole army, including Huntington’s Regiment, built fortifications in the spring and summer at various locations on and around Manhattan Island, including Brooklyn. Poor sanitary conditions in the American camps in New York bred disease, and Washington’s army was heavily impacted. Colonel Huntington himself was incapacitated, probably with malaria, and was forced to pass command of his regiment to Lieut. Col. Joel Clark of Southington, Connecticut, a very capable, but pugnacious and gnarly old veteran of the French and Indian War, who was not a little miffed that he had been passed over for command. Colonel Huntington would play no further role in this story, although he had an illustrious military career as the war played out. After gathering an enormous invasion fleet that transported as many as 24,000 men, on Aug. 22, 1776, the British invaded southwestern Long Island. 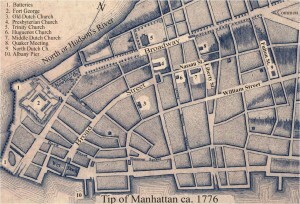 Washington immediately countered by sending several regiments, including Huntington’s, now under the command of Lieutenant Colonel Clark, across the East River to Brooklyn. Between soldiers temporarily posted elsewhere and many who were incapacitated by illness, Clark’s regiment on Aug. 22 had been reduced to fewer than 250 men from a paper strength of about 540. 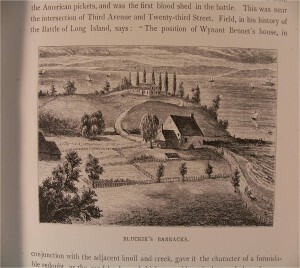 When they arrived on Long Island, the 17th Regiment immediately marched about three miles east of the fortified Brooklyn lines into one of the advance outposts in the Hills, the Bedford Pass, where they bivouacked for the night with Colonel John Tyler’s 10th Continentals, another Connecticut regiment. The next day, the 17th and 10th Regiments were reinforced by two battalions of Pennsylvania Riflemen. Together they marched south through the Bedford Pass, where they attacked Hessian scouts from the British camp at Flatbush. After a sharp skirmish, the Americans drove the Hessians back about half a mile to their lines. The regiment bivouacked in the field for a second night. At dawn on Aug. 24, the 17th was relieved and returned to its lines at Brooklyn. 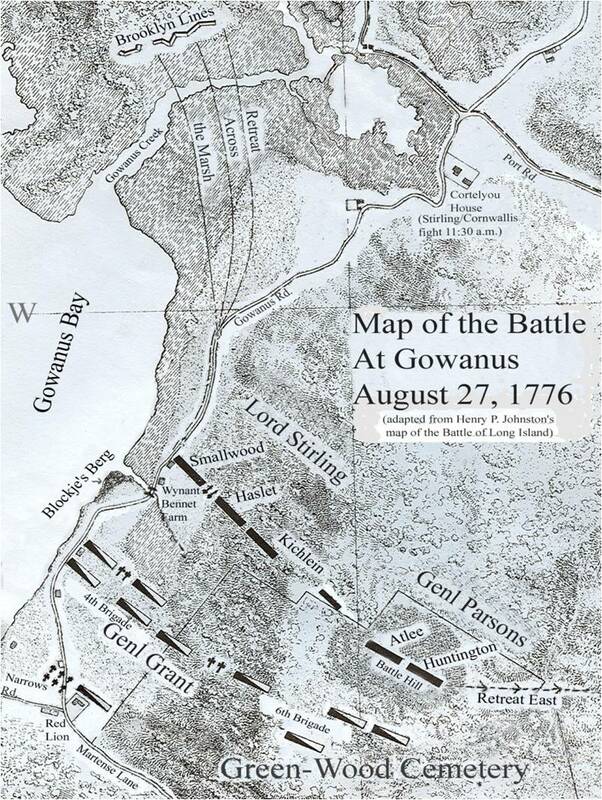 Beginning Aug. 25, a general officer of the day was assigned command of all the forces in the various outposts outside the Brooklyn fortifications. 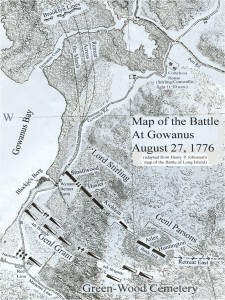 Since it was expected that the British would attack primarily along the Gowanus Road, the shortest route from their camp to Brooklyn, the general officer of the day made his headquarters along that road. Image No. 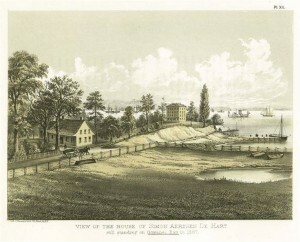 4 depicts the actual house next to Gowanus Bay (on the left in the picture) where the general officer of the day was posted while on duty. It was also the staff headquarters for the American picket force on the west. On Aug. 25, Huntington’s Regiment marched from Brooklyn to join that picket force. 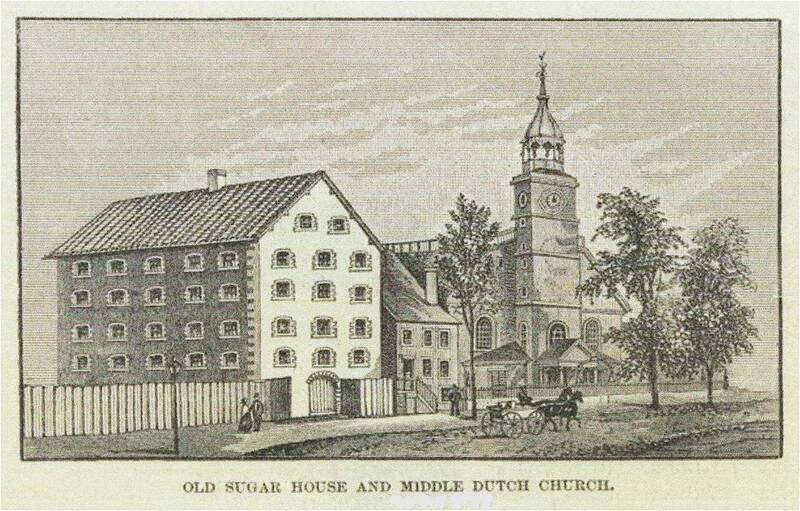 The house, which doubled as an inn for travelers along the Gowanus Road, belonged to Simon Bergen, a Dutch farmer. It was about four miles south of Brooklyn, near the junction of Martense Lane with the Gowanus Road, close to the Red Lion Tavern. From the diary of Lieut. Jabez Fitch of Huntington’s Regiment, we learn that the officers of the regiment were joined for dinner at Bergen’s that night by Brig. Gen. William Alexander, commonly known as Lord Stirling, the general officer in command of the outposts that day. Huntington’s Regiment remained as part of the picket force in the area until late in the afternoon of the next day, Aug. 26, when they were relieved and again marched back to Brooklyn. They left behind mostly inexperienced and untrained Pennsylvania and New York militia as pickets on the west. About midnight that night, the pickets near the Red Lion discovered British scouts lurking in a melon patch, who were dispersed after a brief skirmish. Unfortunately, the main body to which the scouts were attached, commanded by British Maj. Gen. James Grant, had begun to move and was advancing close behind the scouts. An hour or two later, General Grant’s main column marched into the area. This time, after a brief exchange of small arms fire, the American pickets were overwhelmed. A few were captured, and the rest, terrified, fled toward Brooklyn. The general officer for that day, now Connecticut Brig. Gen. Samuel Holden Parsons, asleep in the house of Simon Bergen, was apparently left behind. He was awakened by the officers of his guard who informed him that the British were upon them and that his troops had fled. Somehow he escaped capture and quickly rode north in pursuit of his wayward pickets along the Gowanus Road. He intercepted about 20 of them and by threats and brute force made them form a skirmish line. In spite of his small numbers, Parsons’ bravery and quick thinking pulled the British column up short. 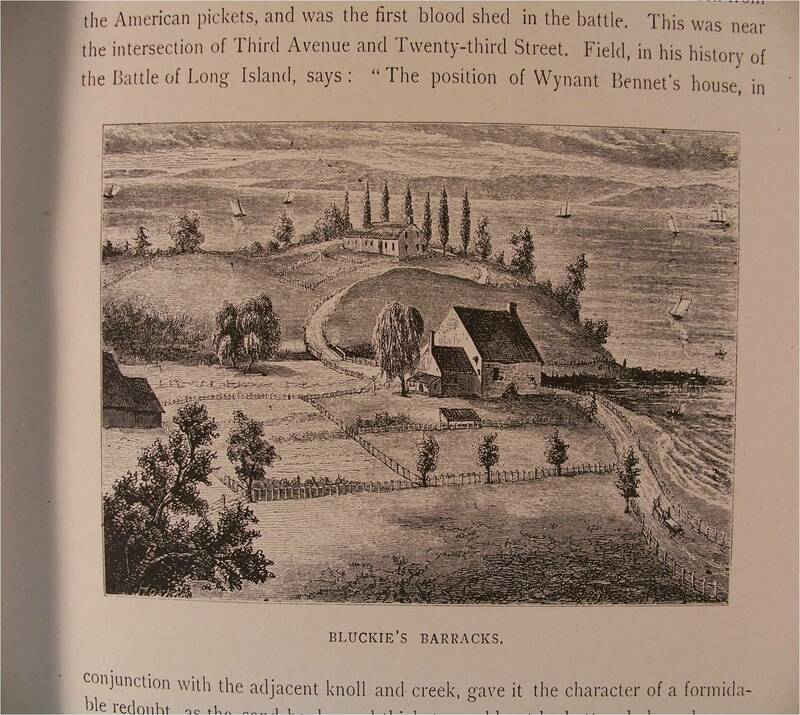 General Parsons likely set up his skirmish line along the Gowanus Road with his back to Brooklyn on the hill along the shore in the background of Image No. 5 known to the Dutch as Blockje’s Bergh. General Grant’s army headed north in a long thin column over the hill along the narrow road. Parsons set up his skirmish line somewhere in the middle of the picture. Meanwhile, some of the fleeing pickets had gotten through to the Brooklyn lines and informed General Israel Putnam, in overall command on Long Island, that the whole British army was marching north along the Gowanus Road. That information was erroneous. Although there was a large force approaching by way of that road, it was not the whole British Army. Grant’s troops were a diversionary force. The main corps of British troops had circled around undetected during the night in a flanking maneuver along the Jamaica Road several miles to the east to get behind the American outposts. Putnam, unaware of the maneuver, took the bait, dispatching Lord Stirling from Brooklyn with a Delaware and a Maryland Regiment to meet the threat from Grant on the Gowanus Road. Those two regiments were followed shortly by the 17th Regiment, with Lieutenant Colonel Clark in command, and part of Lieut. Col. Peter Kichlein’s Pennsylvania Rifle Battalion. Arriving at General Parsons’ hastily set up skirmish line, Lord Stirling assumed command and sent some of Col. Samuel Atlee’s 1st Pennsylvania Musket Battalion forward into the trees and behind the barn near the little bridge in the middle of the picture. These men had been a part of the wayward picket force near the Red Lion. No doubt stinging from General Parsons’ rebuke when his men had fled earlier, this time Colonel Atlee held his men in place in a forward, highly exposed position and continued to check the advance of the enemy with small arms fire. Meanwhile, Lord Stirling fell back slightly and set up his main battle line with the Delaware and Maryland troops on the hill from which this picture was drawn, in the foreground. General Grant was forced to break out of his narrow marching column and spread his forces out in battle formation on the high ground on and behind Blockje’s Bergh. Now came the decision that was to determine the fate of the 17th. Lord Stirling ordered General Parsons, his subordinate in the field, to take command of Huntington’s Regiment, and part of Colonel Atlee’s Battalion — including Colonel Atlee — and file off to the left (out of this picture) into the Prospect Hills. Stirling’s line was protected on his right (the west) by Gowanus Bay, but his left, or eastern, flank was vulnerable to attack from the British if they took the high ground that loomed directly over his position. Parsons took his depleted little brigade, perhaps 300 men, most of whom were from Huntington’s Regiment, and marched to the left and out of sight into the heavy woods of the adjacent section of the Prospect Hills known as the Greenwood Hills. Today this is part of Green-Wood Cemetery. It was the most isolated and remote section of the entire Long Island battlefield. Meanwhile, Lord Stirling set up his battle line with the Maryland troops on the right, and the Delaware men on his left, along with a few pieces of supporting artillery. Stirling’s entire command, including Parsons’ men, was probably no stronger than 1,600. He faced British Maj. Gen. Grant in command of two full brigades, each consisting of four regiments, perhaps 7,000 men strong. Had it been Grant’s intention to force Stirling’s position, he should easily have been able to do so. But his job was to merely provide a diversion until the main British flanking army along the Jamaica Road was in position behind the American forces in the outposts. As a result, Grant, for the most part, simply embarked on an extended exchange of artillery fire with Stirling to tie him down. After dawn the British sprang their trap. The cannon fire on the Gowanus Road signaled British Lieut. Gen. Charles Cornwallis, with the main British Army, to advance along the Jamaica Road behind the American forces to cut off their line of retreat [please see the overall map]. 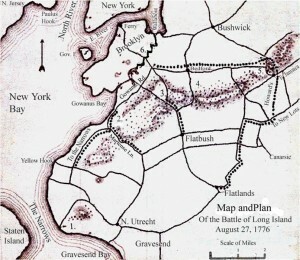 At the same time, Hessian troops at Flatbush advanced through the Flatbush and Bedford Passes to trap the Americans caught between them and Cornwallis’s army. As the men of Cornwallis’s division began to fire from behind them, the Americans in the eastern passes discovered their predicament. 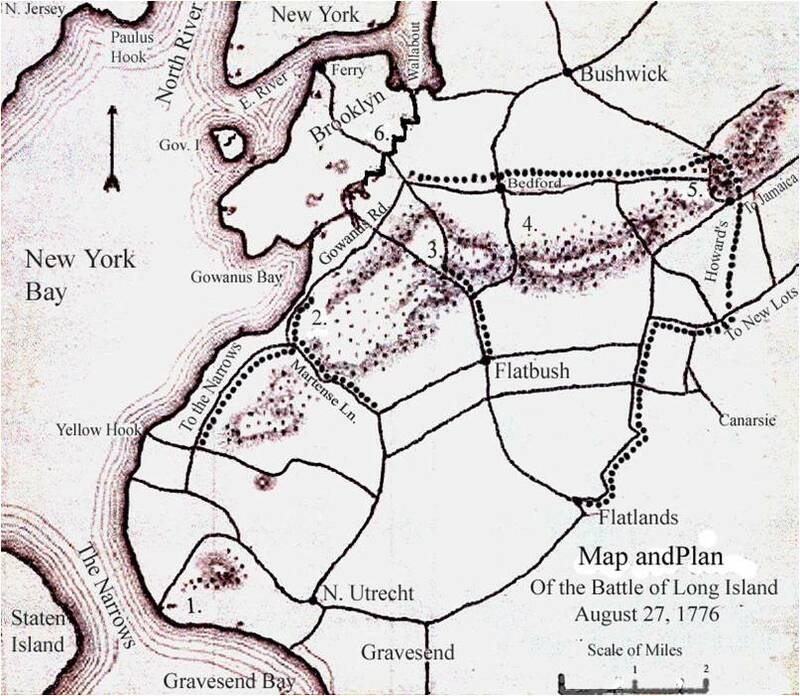 Some of them gave battle and stood their ground as long as possible, especially General John Sullivan’s brigade in the Flatbush Pass, but most of those in the east were quickly overwhelmed and forced to flee in a dead run through the hills to the Brooklyn fortifications to avoid slaughter or capture. Most of those men arrived safely at Brooklyn. But the story was very different along the Gowanus Road. With his artillery holding down Stirling, British General Grant initiated his own flanking maneuver. He sent two or three full regiments into the wooded hills to try to turn the Americans’ left flank, just as Stirling had feared. They marched right into the path of General Parsons with Huntington’s and Atlee’s men. 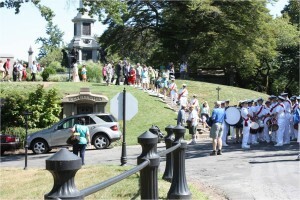 They clashed on a partly cleared steep little hill, later appropriately named Battle Hill, near what is now the northwest corner of Green-Wood Cemetery. Most histories of the Battle of Long Island have almost entirely missed the significance of what happened here, describing merely a brief skirmish when in fact what was to take place in this location became the day’s bloodiest action on the entire battlefield. 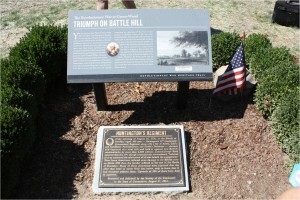 For two or three hours on what was becoming a steamy, hot, late August morning, Huntington’s and Atlee’s men fought to retain possession of Battle Hill. At least three times the Americans repulsed attacks, inflicting heavy losses on the British. The fighting was so fierce and extended that after each fight, the Americans had to strip the British dead of their ammunition as their own ran out. Pvt. John C. Miller of Huntington’s Regiment later said that there was so much smoke from the firing that he could not see more than a few rods distance. The Americans on Battle Hill were heavily outnumbered: 300 against perhaps 1,500 British of the 44th, 23rd and 17th Regiments. Toward the end of the fight, seeing the beating their comrades were taking, the famous 42nd Regiment of Royal Highlanders, known as the Black Watch, moved in to support their comrades. The American losses from the three attacks were light, but they inflicted the heaviest casualties that the British were to sustain on the entire field of battle that day. General Parsons reported 60 of the enemy killed, including a colonel. Parsons’ numbers were similar to the casualty figures submitted by the British themselves: 86 killed or wounded from the four regiments involved. Both Parsons and Atlee reported that only one American was killed on Battle Hill: Lieut. Col. Caleb Parry, Colonel Atlee’s second in command, with two or three others wounded. Parsons’ vastly outnumbered little brigade accomplished its intended purpose. They succeeded in holding Battle Hill long enough to prevent an assault on Stirling’s left flank — and the probable annihilation of his entire command. Meanwhile Stirling seems to have been entirely ignorant of what was happening on Battle Hill. He was engaged in, and must have been distracted by, what had become the first major artillery exchange of the Revolutionary War between forces on an open battlefield. By now things began to go badly for the Americans along the Gowanus Road. About 11 o’clock, Lord Stirling suddenly heard firing at his rear, becoming aware of Cornwallis’s advance behind him. Realizing his brigade was about to be cut off from Brooklyn, he ordered an immediate retreat. For reasons that remain unknown, he failed to notify the Americans still fighting out of sight on Battle Hill that he was pulling out. As a result, Parsons’ men were not only entirely cut off from the rest of their army but also entirely unaware of that fact. Shortly after he began his retreat, Stirling discovered that the enemy had already cut the Gowanus Road between his troops and Brooklyn. In a move designed to save the majority of his men, he sent the Delaware Regiment and half of the Marylanders through the swampy marshes on the lower reaches of Gowanus Creek to try to reach safety at Brooklyn, while he intercepted Cornwallis with the other half of the Maryland regiment, one battalion, in a “forlorn hope” at a stone farmhouse now known as the Vechte-Cortelyou House, near the head of the salt marshes. Stirling’s heroic action checked the British and allowed most of his men to reach the safety of the Brooklyn lines after slogging through the marsh in chest-high water. Lord Stirling himself, after a stiff fight, was forced to surrender, along with much of his Maryland battalion. By this time, most of the American soldiers from the advance outposts had either scurried to safety behind the Brooklyn fortifications or had surrendered, leaving the British in control of the entire battlefield outside Brooklyn. But it was nearly noon before the men on Battle Hill became aware of what was happening. Exhausted and out of ammunition, they marched down near the edge of the hills to rejoin Stirling, but found the enemy filling the Gowanus Road where Lord Stirling should have been. Only then did they discover their hopeless situation: they were surrounded and cut off. Parsons’ command began to disintegrate. Colonel Atlee’s men tried separately to fight their way through the British on the Gowanus Road with no success and were forced to return to Battle Hill. Parsons, still holding the hill, realized it was hopeless to try and fight their way directly back to Brooklyn, and instead sent Huntington’s men east, up the Island and away from Brooklyn. He hoped they might find a weak spot in the British rear guard through which they might escape. Through much of the afternoon, Huntington’s men skirmished with the British and Hessians in a wild, swampy area between Battle Hill and Flatbush. That area is now a lake in the southern part of Prospect Park. Although a few small parties, including Parsons with seven others, were eventually able to sneak through the British lines and circle around to Brooklyn, the large majority of Huntington’s and Atlee’s men were forced to surrender. Although they had sustained only minimal losses during many hours of intense fighting, and had prevented the annihilation of Stirling’s command, it was their surrender that ultimately destroyed the 17th. This painting depicts the surrender of another American officer, but it could as easily represent the surrender of Capt. Joseph Jewett of Huntington’s Regiment. 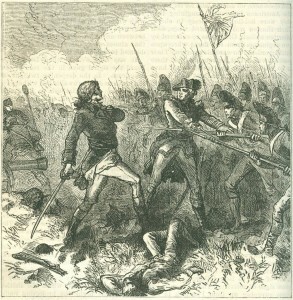 Jewett surrendered his sword to a British officer, who used it to run him through. Captain Jewett lived in unspeakable agony for two long days, succumbing to his wounds and dying on Aug. 29. He was buried very near the place where the Americans first engaged the British two days before: along the Gowanus Road at the foot of Blockje’s Burgh. He left a wife with 10 children in his home in Lyme, Conn. The American prisoners were now herded by their British captors into barns, corrals and churches in the little villages of Flatbush, Flatlands and New Utrecht on Long Island. The British were too exhausted by the end of the day of Aug. 27 to press their advantage on the rest of Washington’s army at Brooklyn, and the Americans held out there for two more days. When General Washington evacuated his remaining troops from Brooklyn on the 29th, he left behind nearly 1,000 American prisoners in the hands of the British, about one-fourth of them from the 17th Regiment. … at about sunset we were all drove down the hatches, with as many vile curses and execrations, as that Son of perdition, with his Infernal Understrappers could express. When we came down into this dungeon, we found but very indifferent quarters, for both the lower decks were very full of dirt, and the excessive rains that had fell of late had drove in so plentifully as to quite cover them, so that a great number of men treading the dirt and water together, soon made [a] mortar of mud near half over our shoes. Besides all those inconveniences, there was no kind of platform, or places prepared for our lodging, but what was so cluttered with artillery, carriages, rough pieces of timber, rigging, etc., that there was not a sufficiency of room for but little more than one half of our number to lay down at one time. To add yet more (if possible) to our calamity, some time in the evening a number of the infernal savages came down with a lantern, and loaded two small pieces of cannon with grape shot, which were placed aft of a bulkhead and pointed through two ports for that purpose, in such a manner as to rake the deck where our people lay, telling us at the same time with many curses that in case of any disturbance or the least noise in the night, they were to be immediately fired on the damned rebels. In this unhappy state, the men of Huntington’s regiment, and all of the American prisoners, remained without adequate food, water, clothing or medical attention for the next 39 days. On Sept. 15, Gen. William Howe, commander in chief of the British Army, finally invaded Manhattan and began to push Washington’s Army north. By the end of the first week of October, the British firmly controlled New York City and began unloading the American prisoners from their floating dungeons. To house the enlisted men and noncommissioned officers, the British commandeered the churches of rebel-sympathizing pastors, gutted them of their pews and packed the prisoners in by the hundreds. Officers, however, were granted parole and allowed to find room and board among friends and other sympathetic citizens of the city. Their survival rate was significantly better than the common soldiers when all was said and done. 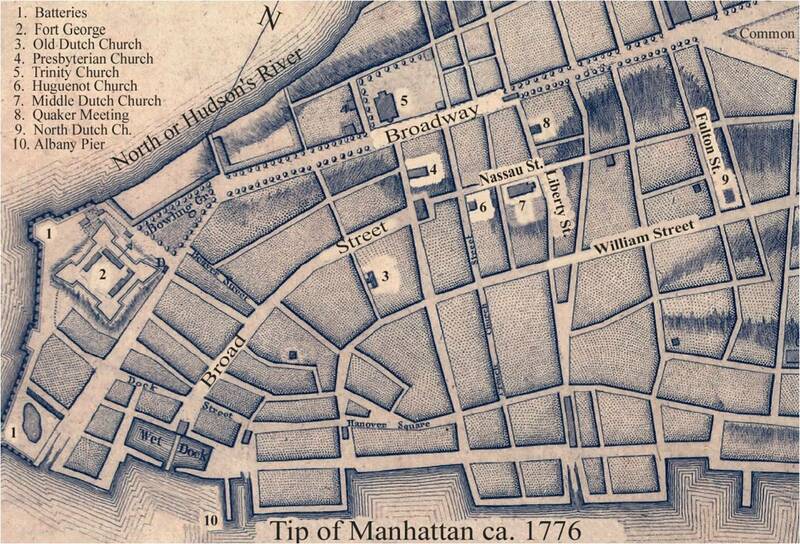 This is a map of lower Manhattan in 1776. It is with twisted irony that the British seized houses of worship to be transformed into dungeons, where hundreds died from abuse and neglect. Most of Huntington’s men seem to have been herded into the Middle Dutch Church, at the corner of Nassau and Liberty Streets. Just a few months before, its bell tolled to celebrate the signing of the Declaration of Independence in New York. I will Endeavor to faintly lead you into the poor cituation the soldiers are in, espechally those taken at Long Island where I was; in fact these cases are deplorable and they are Real objects of pitty — they are still confined and in houses where there is no fire — poor mortals, with little or no clothes — perishing with hunger occasioned for want of food — there natures are broke and gone, some almost loose there voices and some there hearing — they are crouded into churches & there guarded night and day. I cant paint the horable appearance they make — it is shocking to human nature to behold them. Could I draw the curtain from before you; there expose to your view a lean Jawd mortal…, his Rotten Rags, close beset with unwelcome vermin. Could I do this, I say, [it is] possible I might in some [small] manner fix your idea with what appearance sum hundreds of these poor creatures make in houses where once people attempted to Implore God’s Blessings, &c, but I must say no more of their calamities. God be merciful to them — I can’t afford them no Relief. Every morning horse-drawn carts pulled up to the Middle Dutch Church, and the bodies of those who had died in the night were piled in by their comrades — themselves barely clinging to life. The corpses were then taken to the empty entrenchments built by their own army a few months before and thrown in. Some of the men had, no doubt, unknowingly dug their own graves before the British invasion. Although he had not been imprisoned in the churches, Lieut. Col. Joel Clark died on Monday, Dec. 16, 1776. He had not been wounded during the battle, but he had fallen ill from something described as an “unusual disorder” contracted on a troopship. He had been nursed by his fellow officers while on parole, but to no avail. 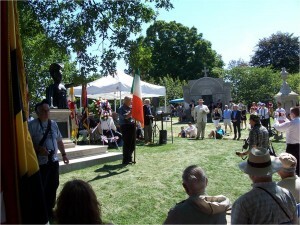 In contrast to the way the soldiers were treated, Colonel Clark was provided a decent burial ceremony, attended by most of the American officers on parole. He was buried in the Brick (Presbyterian) Church yard in the area bounded by today’s Park Row and Beekman and Nassau Streets. With his death was probably lost any opportunity for the full story of the regiment to be written. Of the perhaps 250 men of Huntington’s Regiment who entered the battle on Long Island on Aug. 27, possibly no more than 80 to100 remained alive in the Middle Dutch Church by the end of December 1776. On Dec. 24, almost too late to save any of them, a prisoner exchange was finally arranged. Survivors from Huntington’s Regiment, with 150 other American prisoners, by now no more than human skeletons, were again herded — staggering, tripping, falling and crawling — through the streets of lower Manhattan. On the Lower East Side, the British sloop, Glasgow, waited at dock to take the survivors home. Finally, on the brutally cold winter night of Jan. 3, 1777, the ever-shrinking group of survivors was unceremoniously dumped ashore at Milford, Conn., the men left to fend for themselves; most if not all of them by now infected with smallpox. The good citizens of Milford rushed to their aid, but 46 more of these pitiful creatures were too far gone and died at Milford. The rest wandered off alone into the cold New England night to find their way home. Of this small remnant, still more died along the way, or lived long enough to infect their families with smallpox. This is a picture of the only monument in Connecticut to honor the prisoners from New York that has been found. 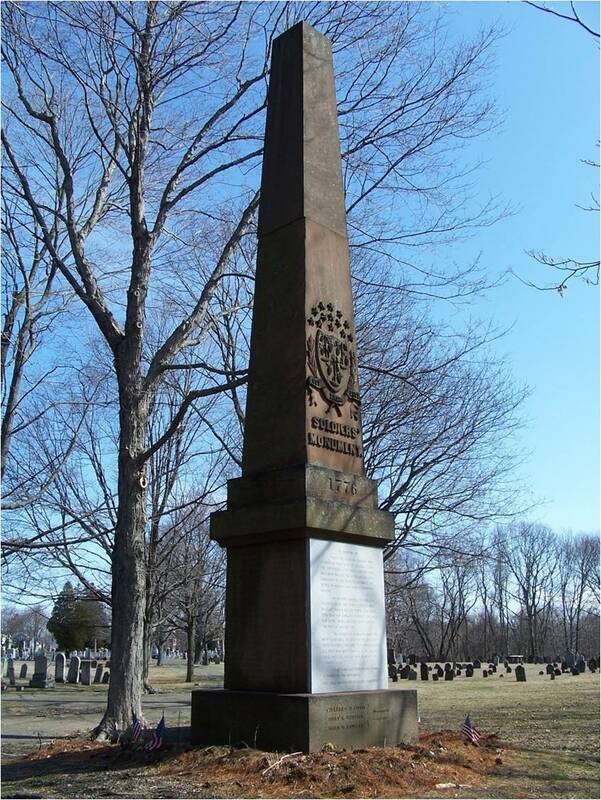 It was erected in the Old Milford Cemetery near where the cargo of smallpox-infested prisoners was dumped ashore in January 1777. On it are inscribed the names of the 46 men who died in Milford of smallpox. Among the names are eight men from Huntington’s Regiment. Also there is the name of Capt. Stephen Stow, a citizen of Milford, who in an act of extraordinary Christian charity, knowing full well he was endangering his life, volunteered to nurse the sick men. He made his will, put his affairs in order, said goodbye to his family and friends and went to work. Within a month he, too, was dead. 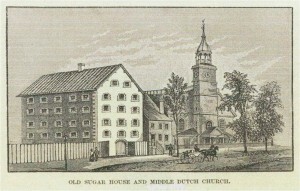 The consequences of the conditions in the New York churches were not confined to the former prisoners, but raged on in their families, friends and neighbors in the weeks after the few survivors from the Middle Dutch Church returned home and unwittingly infected them with disease. Only with cold, hard numbers can we comprehend the full disaster to the 17th Continental Regiment. On a roll taken after the Battle of Long Island, 208 officers and soldiers from the Regiment were reported dead or missing. That is probably a low figure. All but a few of that number were prisoners of war. We have estimated that just 80 to 100 men from the regiment survived captivity to be herded onto the Glasgow on Dec. 24, 1776. Of those, several perished on the sloop, with many more dying at Milford, or shortly after returning home. Perhaps 50 men, but no more than 75, lived for any length of time afterward. Research has uncovered about 40 of those patriots, whose subsequent histories in many cases are remarkable. Some — as traumatic as their ordeal had been — reenlisted for service in the Revolutionary War, and a few even served until war’s end. Except for a handful, the officers of the regiment did not suffer to the extent that their men did. After their parole in the city, they were subsequently paroled to enemy-held Long Island to live with families who were paid to board them. Even though they were in more comfortable circumstances, many were held much longer; some of them were not exchanged and allowed to return home to Connecticut until the spring of 1778. Whether they survived, or paid the ultimate price in the ghastly aftermath of the Battle of Long Island, for far too long, the Connecticut men of Colonel Jedediah Huntington’s 17th Continental Regiment have gone without the recognition they deserved from a grateful nation for their suffering and their heroic stand on a lonely, isolated hilltop one hot, muggy August day in 1776. We can now happily report that the regiment, at long last, has received a small measure of respect and honor for its sacrifice. 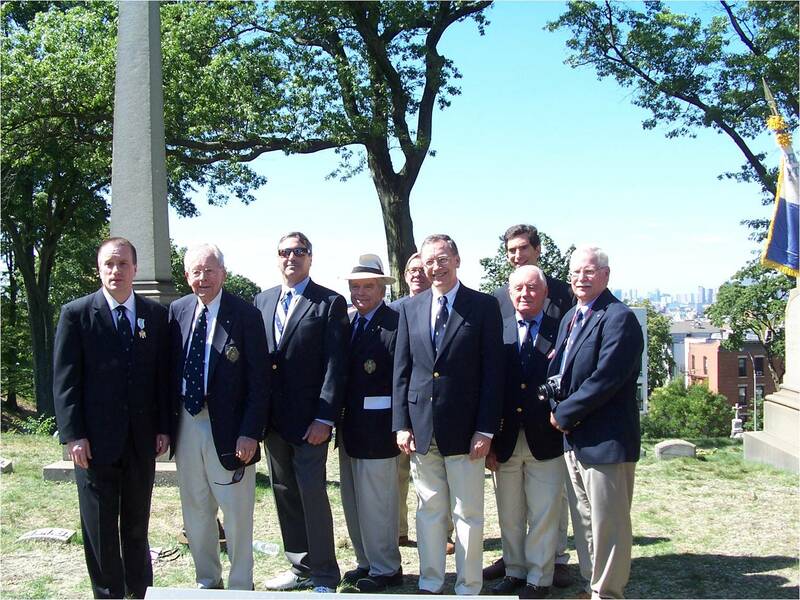 On Aug. 25, 2013, during the annual commemoration of the Battle of Long Island in Brooklyn, the Society of the Cincinnati in Connecticut, with the cooperation of Green-Wood Cemetery, dedicated new interpretive signage and a bronze plaque on Battle Hill in Brooklyn. The signs and plaque finally get the story right about the scale of the battle fought there and the critical role played by Huntington’s Regiment in preserving the greater part of George Washington’s Army to fight another day.